I am giving away an autographed copy of James Farmer’s Wonderful new book, “A Time to Plant’—just in time for Christmas. To enter, check out his new blog allthingsfarmer.com and come back and leave me a comment about it. How easy is that! I will have the drawing this Friday, December 16th, and I will announce the winner in a blog post on Saturday. It is the ‘Most Wonderful Time of the Year!’ And remember the Wonderful outdoor room I posted in ‘Fall Weekend?’ Well it’s time for more. 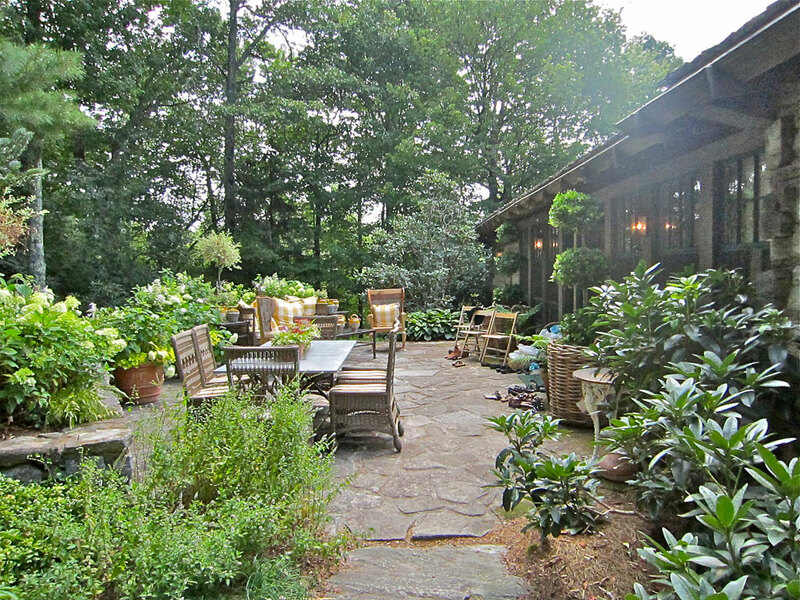 This Patio was designed by James Farmer—author, cook, host and designer extraordinaire! His use of sunny checked fabric mixed with the wicker and rustic iron furniture is so welcoming. I love the mix of hydrangeas and topiary behind the loveseat. 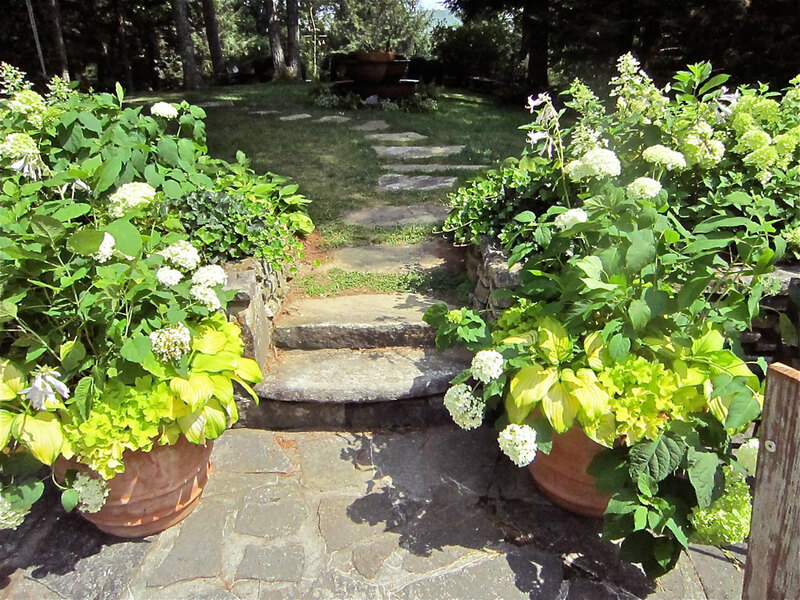 More pots filled with hydrangea and sweet potato vine flank the stairway to the lawn beyond. What a Wonderful and enchanting place to entertain. 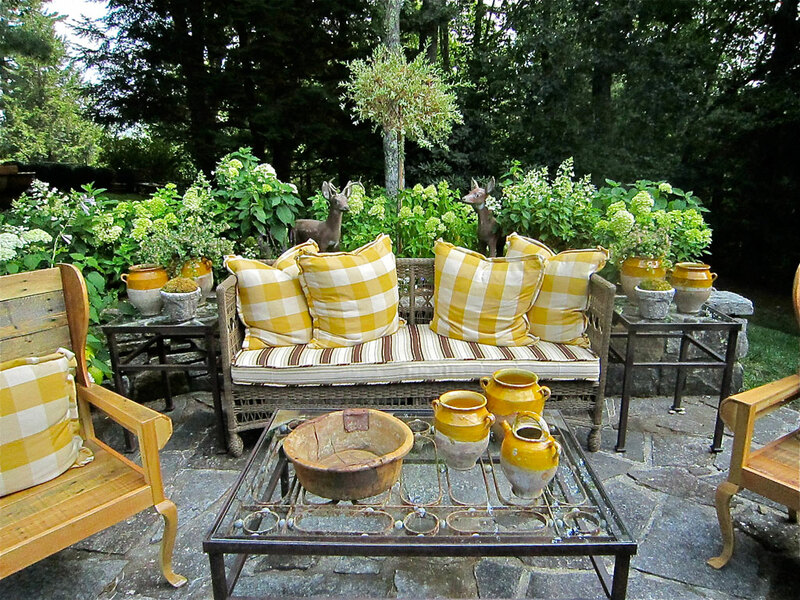 I love the sunny fabric and the raised flower beds behind the wicker loveseat. 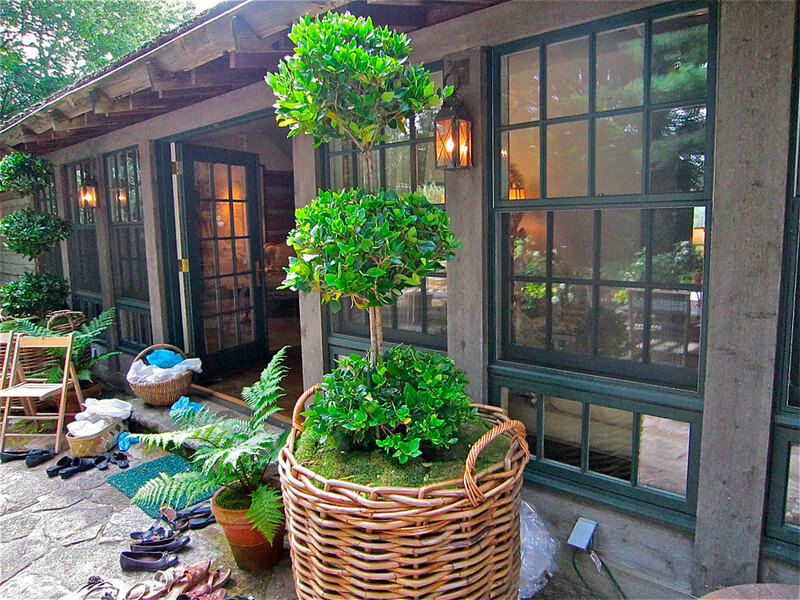 Large wicker baskets planted with topiary—I need these! Merry Christmas—Enter now! The winner will be announced on Saturday. Well I really feel inadequate! His gardens are beautiful as well as creative. Thank you Missy for this wonderful resource. So sorry Lissy. (not Missy)! I tried to type as fast as I talk.. impossible. i love the wing chairs on showhouse patio ~ hmmm. . .can alastair make??? one day we’ll be in awe of your book. . .la grande dame Lissie! I loved the use of salmon/peach/pink for the holidays. I need to run to Cut Flowers!! Thanks. Roses in the silver julep cup– just did that for a party! Want the book. Lissy, Thanks so much for the opportunity to review. I have seen the book in Highlands and would love to own it. Wish me luck. Hey Lissy! I loved his blog. I love his infatuation with shades of orange for the holidays. Personally I love pink and lime green for holiday decor. Love the granny smiths and grapefruit in a blue and white bowl and also love the idea of just pulling natural items from the garden — to bring the beauty of nature inside for the holidays — pinecomes, evergreen — I love the yellow and green of acuba leaves…. Thanks for sharing! Ok, Lissy! I LOVE “All Things Farmer”! I don’t know where to start! We have too much in common! In my own home I happily mix oranges, terra cottas, and peaches with fruity reds year round, but especially at Christmas. My dining and living room walls are a luscious melon color. It looks divine with pomegranates at Thanksgiving and Christmas. Yum! LOVE rosemary. In the language of flowers, rosemary means “remembrance”, and that’s why is is so prevalent for Christmas, remembering special Christmases, those we love, and the reason for Christmas that began in a manger so long, long ago. I could go on and on and on . . .
Merry, merry Christmas to and my new favorite Farmer. By the way my Daddy WAS cotton farmer for 40 plus years. Needless to say, I would ADORE the book. Love his blog and especially his recipe for tea. What a great idea—mix one bag of earl grey with four bags of regular. I should have thought of it myself! James Farmer has a beautiful eye for design. Just as you said, Lissy, design is design; Farmer’s talents reach far beyond landscaping. Love it! I must have it . Hi Lissy!! Love the mantels with the lilies and the federal mirror!! Gorgeous! Agree totally with using different hues of reds for the season. It really expands the ideas of RED and GREEN in a room. His reindeer was so cute with the green bow!! Your blog is wonderful!! Darden Straus Designs loves it! !